No sound except very first video. I fixed the problem. Not sure what it was but simple W10 troubleshooting was good enough. Awesome course, highly recommended for all beginners. Big thanks Jonathan! I'm here to teach you how to make games for fun or to solve a problem. Along the way I will be showing you how to use the latest technologies. But whats more important, is that I will share with you the mindset I have developed for getting my head around new technologies and how I solve problems / stay creative. and now I want to share all of that with you. I love the feeling of helping students master new skills and become experts in whatever field they choose, and I'm really excited to get to know you. "Great Patience, was always able to solve the problem, then explain to the students." "Always helps to the best of his abilities." "Jonathan knows what he is talking about when it comes to his chosen field." "Jonathan is really knowledgeable about what he teaches, and this really shines through whenever he leads the class tutorials. He shows genuine interest in everyone's work and was extremely helpful when I needed his assistance via email." "Communicates to his students very well, and ensures you're understanding everything." "Cares so much and makes sure that everyone is keeping up. brilliant teacher." "Very committed person when it comes to helping students with his knowledge." "Jonathan is an excellent teacher that goes above and beyond what is required." "He is perfect to be a teacher." "He has great teaching skills, he has a good communication power." "Friendly and enthusiastic to help others, have a good understanding." "Very approachable, knowledgeable and helpful." "Jonathan's great! Not only does he know his ways around Unity but also with many other very useful Plugins that come with it." If you are a Student, Startup or Indie Developer. 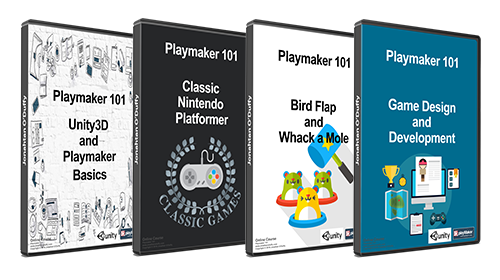 I recommend checking out the "Playmaker 101 The Complete Course - Community Edition"" as I provide discounts to help support these communities. 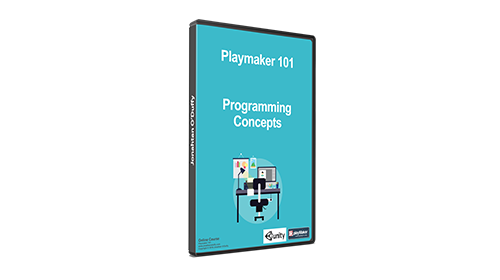 Alternatively you might also like to checkout "Playmaker 101 The Complete Course - 30 Days" . Game Development Tips and Tricks. Confidence in your ability to make Games. 20 Chapters with over 200 videos totalling almost 11 hours of condensed content. Taking you from the very beginning and making sure you understand the concepts in making games. Instilling in you the confidence in your own abilities to make games. Then pointing you in the right direction to continue on from this course in creating those games. Includes Bonus Chapters on Programming Concepts to help take your Playmaker Skills to the next level. Plus a Certificate on completion to show off your achievement. This course was created with Unity3D Software, Version 5.3.4f1. You can follow along with the Free or Paid Version. This course was created with the Playmaker Plugin, Version 1.8.0 Beta RC43. You will need to have a Playmaker license to follow this course. You will need a Computer and standard computer peripherals that is able to support the required software. See the Unity3D website for more information. You will need basic Computer Skills to follow along. This course is not a course on teaching how to become proficient with computers. This course was created in Microsoft Windows 8.1 Operating System but should be applicable to other operating systems providing the above requirements are met.